Basically an F-Clamp without the tail, extendable C-clamps can be quickly adjusted and provide more clamping power than similarly sized quick-clamps. Plus, since the bar doesn’t extend past the body of the clamp, you won’t snag stuff on it. The top jaw of these clamps can be extended to fit the work piece and when it’s in place, you tighten the screw on the bottom jaw just like a C-clamp. I could find two manufacturers of these extendable C-clamps — the first company is Stretta, which appears to have a website if you look at the clamp closely, but I can’t make it out or find it through other means. It also looks like retailers have cleared out their inventory of these clamps; one of the only places that still carries them is Woodworker’s Supply. On the gripping hand, the Grip version looks like it’s available in a few more places. 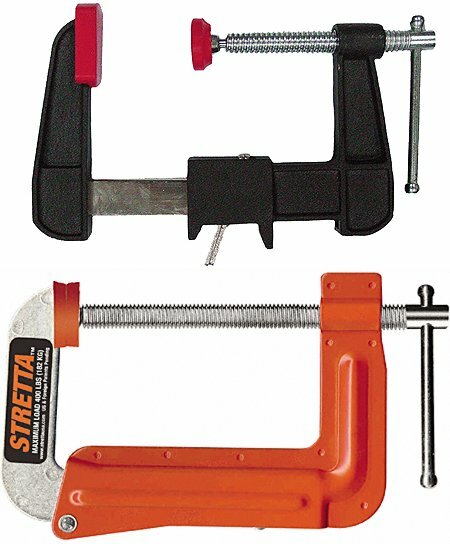 The 2″ to 3″ version and 3″ to 5″ version of the Stretta clamp can apply 300 lbs. of pressure and cost $8 and $11 respectively. The 4″ to 7″ and 5″ to 9″ versions can apply 400 lbs., but it doesn’t look like they’re available. The 4″ and the 8″ Grip clamps run about $8. I need to get my paws on these for the shop. This is made of so much win and usefulness! Kudos to you guys at Toolmonger for discovering these! I freaking hate it when I snag myself on an F-clamp. If only they weren’t so damn useful. It’s even worse when, in addition to getting hurt, I mess up the project. I got one of these in my stocking this year… $10 bin from Tractor Supply. I got a set of these from CanadianTire onsale for about $10 and they have been very useful in the shop. “On the gripping hand”…….. nice reference. I don’t like the design. At full extension there’s going to be a lot of force conspiring to break or flex the clamp at the expansion joint over time. I have a small set of 10″ sliding F clamps with a 1″ wide, notched, steel bar, (made similar to the lower pic) that do everything these do and certainly won’t suffer any flex or break. I can always see the appeal of novel designs – but think that Brau has a point about this design having a weakness. I don’t know that this weakness is a fatal flaw – since this looks to be intended for use as a light-duty clamp for glue-ups and general holding – not something to apply tons of pressure. If you need the latter – look to forged “C” and “J” clamps that are rated to take it. I found a Stretta extendable C Clamp it has a 4-7 inch opening I live in marietta oh and went across the river to parkersberg wv to odd lots got to looking around in the tool section and found this Stretta extendable C Clamp for $7 it was the last one they had I got it to use to hold mower blades when sharpening them for people I camp with in the summer it will come in handy while clamping the mower blade dwn to the edge of a picnic table. This is the first and only one I have ever seen for right now. I showed a few friends and they thought it was pretty kool find. Nothing new. This tool design is centuries old and was first invented in East India.